Pastor Kelly was born in Lumberton, North Carolina. 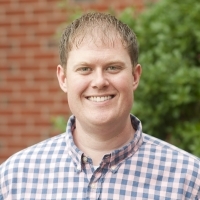 He received his Bachelor of Arts in Biblical Studies and History with a Minor in History of Ideas from Southeastern College at Wake Forest (2005), a Master of Divinity in Biblical Counseling from Southeastern Baptist Theological Seminary (2010), and his Doctor of Ministry from Southeastern (2017). He previously served as Associate Pastor at Grey Stone Church in Durham, N.C. Pastor Kelly has also traveled throughout N.C. and S.C. doing extensive pulpit supply work, revivals, etc. His passion is disciple-making, preaching and teaching God’s Word, and seeing lives completely changed by its power. Pastor Kelly has also served on the Board of Directors for the Baptist State Convention of North Carolina and the Nominating Committee of the Southern Baptist Convention. He is married to his sweet wife, Lindsey. The Bullard's have two sons–Caleb and Camden. They enjoy traveling, playing with their dog, Cody, and spending time with family and friends.